The past decade has seen a reduction in enrollment and graduation rates in the male population. Based on data provided by the National Center for Education Statistics, only 37.9 percent of enrollees were female in 1960. Female enrollment then began to rise and eventually surpassed male enrollment permanently in the 1990s. The cause of the male decline in higher education settings is created by two major factors. First, changing times have caused the demand for men to be the breadwinners in the family to decline. Second, males rarely see an advantage related to the economic outcome of obtaining a degree due to the rising costs of education. 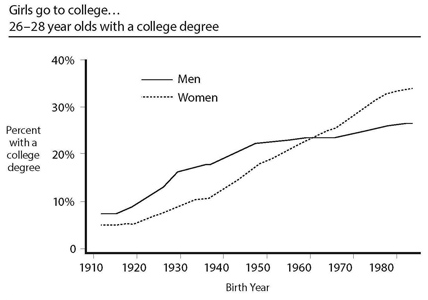 Men don’t have the same drive to attend a college that they had thirty years ago. Once upon a time a man was the one who was educated, worked at a large company and supported the family. Modernized times introduced two-income households and women began climbing corporate ladders ahead of their husbands. As a result, women and men began to lose the opinion that a man’s college education was a necessity for the sake of their family’s future as they once did. If a man has a steady job and brings home a paycheck, a two-income household will bring home as much as a single degree holder in an advanced career will. It takes much longer to land an advanced job with high pay than it used to be. Graduates were typically from high-class families with heirs who followed in family professions. College graduates would be welcomed to their family practices or under internships with family friends. Low to middle-class families typically don’t have those notable connections. Once a degree has been obtained by the average graduate, they must start at the bottom of a very large ladder making approximately $25,000 a year and may never make more than the average annual salary of the holder of a bachelor’s degree, $50,000 a year, in their lifetime. The second event which has caused the decline of men in college is the cost of education. There are more scholarships and grant opportunities for women than there are for men. In addition, the cost of college, which averages $40,000, causes the much more frugal nature of man to come into play. Men are typically much more watchful than women with money and spending habits. If a person will never make more than $50,000 a year, again this is the average income of a person who holds a bachelor’s degree, is a $40,000 degree worth the time, effort and cost? Men are also prone to a desire for instant gratification. The time and money put into the education process take away from the time and money of the now, thus causing a loss of the instantaneous results. In summary, the changing social climates and the cost-benefit analysis of education plays an important role in the disappearance of men from college. The lack of men in college does not necessarily signify a socio-economic crash, but perhaps shows us how the roles in our culture have changed. While social orders continue to change and tuition costs continue to rise with little increase in salaries, men can be hypothesized to have their current population decline further over the next several decades. It is important to look at the changing demographic of our campuses, but there are a range of factors as to why the gender gap has widened. I’m not sure it’s fair to say that young men lack the drive that women have. To be sure, some economic barriers for women have been alleviated, however, there are also socio-economic and racial issues that are barriers for young men to pursue college. It is quite a complex issue! I do appreciate the data in your chart. Very interesting. However, you make some claims about male preferences and their personalities that should be supported by published research. You say men are “more watchful” then women in how they spend money and in their “spending habits.” You say men “are more prone to a desire for instant gratification.” What is the evidence for these claims about men on the one hand being more watchful than women, yet also more prone to instant gratification? And is there not a contradiction here that needs explaining, in terms of personality traits?